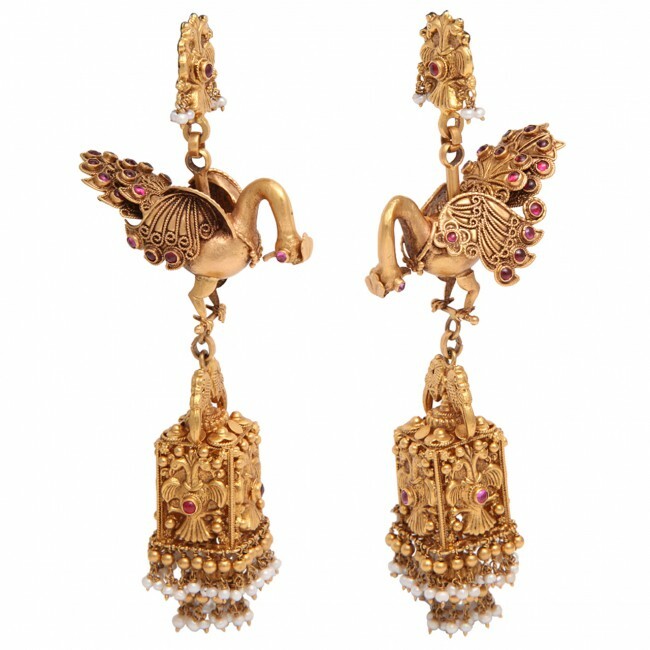 A pair of earrings composed of 18kt yellow gold peacocks with bezel set cabochon ruby eyes and feathers. The peacocks suspend 18kt yellow gold bird cages. The cages showcase four plaques of baby birds and have 18kt yellow gold and natural pearl fringe at the bottom of the cages. The peacocks are suspended from a single plaque containing the same baby birds and embellished with cabochon rubies and natural pearls. 18kt yellow gold, ruby and natural pearls..